Sir Robert Boyle's law says that as gas pressure increases, gas volume decreases. Jacques Charles' law says that with constant pressure, gas volume increases and decreases with its temperature. John Dalton added that in a mix of gasses, the total gas pressure is equal to the sum of their individual pressures. William Henry, finally, figured that the amount of gas that will dissolve in a liquid is a function of its partial pressure and how easily the liquid absorbs gas. Now why are those laws important to divers? Boyle's law describes how gas gets compressed as pressure increases. Pressure is measured in many units, but for simplicity's sake, let's use atmospheres. One atmosphere is the air pressure at sea level. One atmosphere also translates into 14.7 pounds per square inch, or 14.7 psi. At a depth of 33 feet in the water, the pressure doubles, which means gas down there is compressed to half its volume. And every regular breath of air actually takes in twice as many air molecules as on the surface. That means the air in the tank only lasts half as long. For each additional 33 feet of depth, the pressure increases by another atmosphere. So the total pressure at 33 feet is two atmospheres, at 66 feet three atmospheres, and so on. At a depth of a hundred feet, the pressure is four atmospheres, and the air in the tank only lasts a quarter of the time it would on the surface. Never hold your breath when you scuba dive! Charles' law describes why a scuba cylinder being filled with air gets quite hot (ever noticed how a bicycle pump gets hot when you use it?). So it's nicely filled at the dive shop, but once it cools down you see that the pressure inside the tank is now much lower. That's because gas pressure gets lower when the gas gets cooler. Dalton's law explains how the partial pressures of individual gasses make up the whole pressure. So the ratio between the gasses remains the same, but since they are compressed, they may do damage. For example, if a bad compressor pumps some carbon monoxide into the tank, at the surface that would not do much damage, but at depth the amount of carbon monoxide inhaled could become deadly. Why is that? Because while the percentage of carbon monoxide stays the same, at, say, 100 feet we'd still breathe in four times as many carbon monoxide molecules--enought to do damage. Likewise, normally safe gasses like oxygen can become toxic under great pressure. Henry's law is extremely important as it describes how gas gets absorbed in liquids under pressure. The problem is that the various tissues in the human body absorb and release gasses at different rates. And people also come in all sizes and shapes. That means that it is extremely difficult to accurately predict "ingassing" and the much more dangerous "outgassing" into and out of tissue. 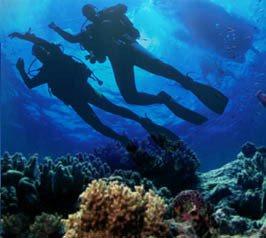 Dive tables, and more recently dive computers, contain data that shows safe rates of ascent, but they are all based on numerous assumptions. As a result, there are different algorithms, all of which are likely to err on the side of caution.